** spoiler alert ** Elizabeth Wein has, with consummate skill, written a powerful story about two girls from vastly different social backgrounds who, at the start of World War II are thrown together and quickly became firm friends. Maddie is a working-class girl from Stockport whilst Julie's ancestry goes back to a certain William Wallace who defeated an English army at the Battle of Stirling Bridge in 1297. Maddie is a WAAF radio operator who, because she'd learnt to fly in 1938, soon finds herself transferred to the Air Transport Auxiliary as a ferry pilot whilst Julie, who speaks fluent French and German, is seconded into the Special Operations Executive. Sometime later, with Maddie wrestling with the controls of flak-damaged Lysander, Julie - no, I am not Scottie, Queenie or Lady Julia Lindsay MacKenzie Wallace Beaufort-Stuart; I am simply Julie - parachutes into occupied France. Captured and tortured by the Gestapo - thanks to a snafu before take-off Julie finds herself carrying Maddie's logbook and ATA papers - she becomes a modern day Scheherazade, forced to write a believable report of the organisation, defences and activities of the RAF. A consummate actress with a powerful imagination her manuscript - you're reading her thoughts and her words as she writes them - skillfully merges fact with fiction, embellishing what the Gestapo already know and what they can probably check. As a result their decision whether to have her shot, guillotined, sent to a concentration camp or simply used for medical experiments is, time and time again, delayed. Does Julie survive her interrogation and torture at the Gestapo headquarters in Ormaie? Does Maddie survive the crash? Do either of the girls get back to the UK? As you read Julie's manuscript you'll undoubtedly notice that several phrases and sentences are underlined: this isn't an editorial oversight and they play a critical role in the finale - a finale which is best summed up by the proverb "Revenge is a dish best served cold". Perhaps prophetically those words first appeared almost 100 years earlier, in the French novel 'Mathilde' by Marie Joseph Eugène Sue. And, as SS-Hauptsturmfuher Amadeus von Linden and his colleagues quickly discover, the French maquis are very skilful in ensuring that 'La vengeance se mange très-bien froide'. 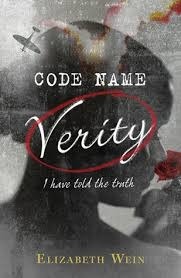 Sign into Goodreads to see if any of your friends have read Code Name Verity. “I am no longer afraid of getting old. Indeed I can't believe I ever said anything so stupid. So childish. So offensive and arrogant.